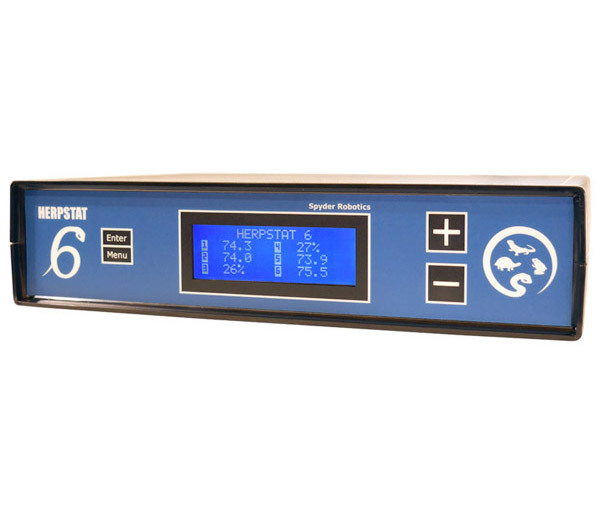 Spyder Robotics Herpstat 6 Thermostat from ARS Caging, Professional Caging for Professional Breeders. Reptile Breeding Systems and Rodent Breeding Systems. Six grounded outlets capable of true proportional heating. Constantly monitors and adjusts amount of heat necessary to maintain a target temperature (Usable range from 40°F to 150°F or 4°C to 65°C). Outputs 1, 2, 5, 6 are configurable for Heating/Cooling/Lighting. Outputs 3 & 4 can be configured for Heating/Cooling/Humidity/Lighting with simulated sunrise/sunset and moonlight features. Basking assist feature supports basking lights as a heat source. Safety Relay can disconect power to all six outlets if an error exists. Soft startup slowly applies power during initial warmups. 375 Watt rating for each output (1800 watts total output) sufficient for most incubators, rack systems, enclosures, and vivariums.